Allow me to introduce myself, my name is Tom and I am the grand mastermind (I use that term loosely) behind this website. Having always been an entrepreneur at heart, I started this site over 5 years ago because of not only my love for dogs, but also as a way express my enjoyment of writing as well as the love I've had of making people laugh since I was a kid. Yes, I was a class clown. No doubt as you go thru this site you'll encounter some of my unique humor, well, it's mine and you might have noticed it's pretty off the wall at times, but heck, dogs are a fun topic and finding a good name should be a fun thing, so I've tried to make it more so. 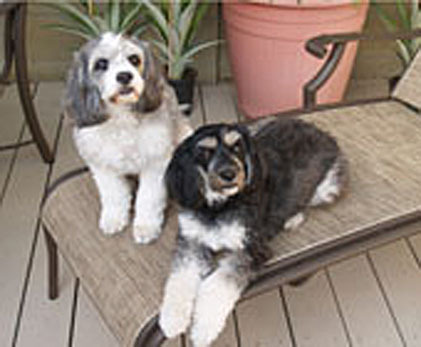 When I was growing up my family had two dogs, Frisky and Taffy. Frisky was our first and was my sisters, and was loved by all. Frisky was of dubious lineage and seemed to be called everything but Frisky. Names like Friskella Louise when it was good, Friskella on an average day, and a lot of other more "colorful" adjectives when she was bad. Ahhh but that dog was loved. Frisky also taught me a thing or two about the birds and bees. It was a shocking sight for young eyes, but Frisky never complained. Not long after, Frisky became a Mom ** which started a family debate, which puppy do we keep, would it be Pickles? Fred or Ethel? (I Love Lucy was a popular T.V. show back then) or Taffy? Well, since this was going to be "my" dog, Taffy won out, and the other pups went on to happy homes. Besides, what young boy with a degree of self respect would want to have a dog named Pickles? Needless to say, Taffy was a fun part of my growing up as she always wanted to play ball, and followed me everywhere. She never had her own litter as we learned from past experiences to keep the back gate locked, but I'm sure she would have made a fine mom. Nowadays, due to my living circumstances I'm unable to have dogs, so I vent my dog loving urges on my sister Dede's two dogs Barney and Pepper. Her dogs are characters to say the least, with Barney acting more like a girl and Pepper (a female) behaving like a boy. Their gender twisted antics have given our family a lot of interesting memories as well as laughs. **I totally encourage all dog owners to have their pup spayed or neutered as to avoid unwanted litters. Our family didn't have Frisky fixed because back in the 1960's it wasn't promoted as heavily as it thankfully is today, so it didn't cross our minds, nor would it have been in the family budget. Besides, Frisky was a backyard dog...this is proof though that "things happen" so please...spay or neuter!! This site is a labor of love that has been built page by page over 5 years. Traffic as well as income (how can you not stumble over all the ads I have on this site? lol) has grown steadily over the years to where I now get thousands of visitors daily as well as the nice income that comes with it. So how did I build this website? I use one of the greatest/easiest website building softwares out there called Solo Build It! better known as SBI. Once built, SBI has allowed me to realize a nice passive income as well as sharing my love for dogs. SBI even offers a 90-day guarantee, bow-WOW! Pooches Gracias for visiting my site, and I hope you find a name that your pup will be proud to have! 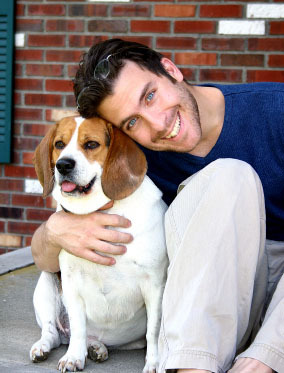 Photo Disclaimer: The picture of the model with the Beagle at the top of this page is not me. Since I'm over 350 years old (in dog years), and no amount of Photoshop can make my photo look anywhere near as handsome, I figured I'd be merciful, and post his picture instead. I think the Beagle is handsome too!